What Happened to Elizabeth Downey Spracklin? My cousin wanted to know what happened to the children of Henry and Elizabeth’s after his death. They were very poor. Elizabeth did received $300 from Weyerhaeuser-Denkmann as compensation for the death of her husband. The other mystery was what happened to Elizabeth? She disappeared from the records after 1898? 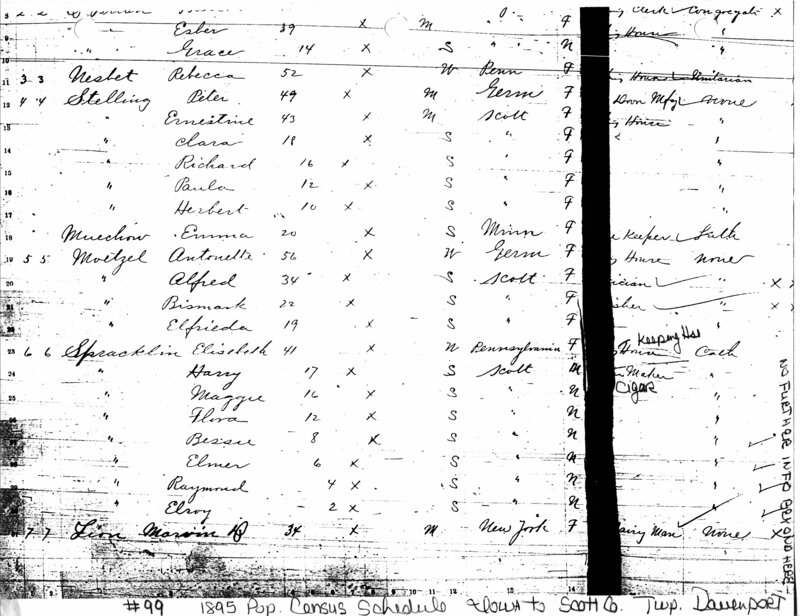 Source: Elizabeth Spracklin Family, 1895 Iowa State Census, Davenport Twp., Scott Co., Iowa Microfilm #99, 4th Ward in Davenport, Line 23, Dwelling 6, Hse 6, State Historical Society, Des Moines, IA. Spracklin, Elisabeth, age 41, Widow, Born in Pennsylvania, Keep House, Catholic, Harry, age 17, Single, born in Scott Co., Cigar Maker, Catholic, Maggie, age 16, Single, born in Scott Co., Catholic, Flora, age 12, Single, born in Scott Co., Catholic, Bessie, age 8, Single, born in Scott Co., Catholic, Elmer, age 6, Single, born in Scott Co., Catholic, Raymond, age 4, born in Scott Co., Catholic, Elroy, age 2, born in Scott Co., Catholic. In this 1895 State Census for Iowa, we see that 7 of the children are living with Elizabeth. The missing children are Edward Oliver, Sophia, Wilbur, John Daniel. I turn to Daniel, their grandfather and Henry’s father and take a look at the his 1895 entry. Source: 1895 Iowa State census, D. D. Spracklin Family, Film #1929364, Iowa, Iowa Co., Dayton Twp., Iowa Co. Gen. Society. Hse # 66, family #67, Daniel Spracklin, age 65, married, born in Ohio, father foreign birth, mother native, farmer, under religion “none.” Sarah Spracklin, age 57, married, born in Indiana, both parents natives, keeping house, Protestant. Daniel Spracklin age 24, single, born in Iowa, farmer, no religious affiliation. Edward O. 15 yrs. old. (Alfred M. Spracklin D) age 17. Both Edward and Alfred were born in Iowa. Religious affiliations not indicated. We see that Daniel is caring for Edward O. and that identifies one of the children missing from Elizabeth’s household. Elizabeth disappears by 1898 and doesn’t reappear in the 1900 U.S. Federal Census. What happened to Elizabeth the wife of Henry? Line 97, Dwelling #103, Family #103, Spracklin, Daniel, Head, White, Male, born Feb 1830, age 70, married, 37 years, born in Ohio, father born in England and mother born in Ohio, occupation farmer, reads and writes, owns land, been there 34 years, there is a farm house. Spracklin, Sarah, wife, white, female, born Aug. 1836, she is 63 years old, married 37 years, 7 children living, 6 out of 7 still living, she was born in Indiana, father was born in Virginia and mother was born in Ohio. She can read and write. Spracklin, Daniel G., son, white, male, born Sept. 1870, age 27 years, single, born in Iowa, farm laborer, he can read and write and did attend school. Spracklin, Charles Ed, son, white, male, Sept. 1874, age 25 years, born in Iowa, farm laborer, can read and write, attended school. There is no mention of Elizabeth nor any of her children in Daniel’s household in 1900. 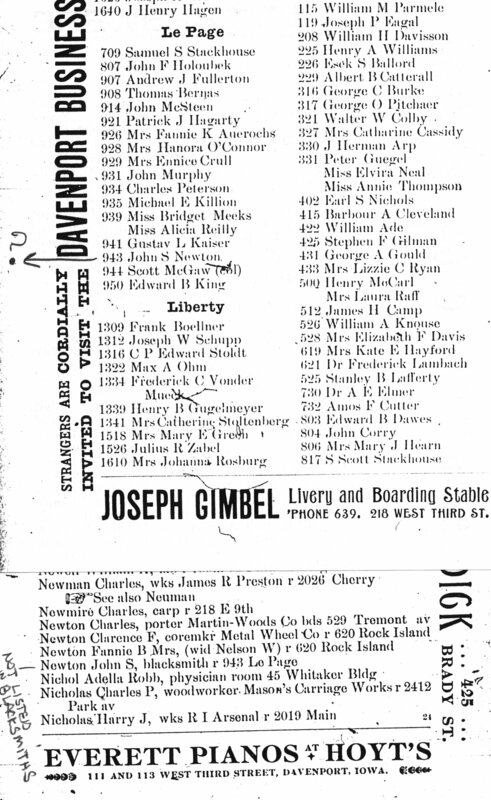 At this point I turned to the city directories for Davenport, Iowa starting in 1894. I did this research at the Iowa State Historical Society branch in Iowa City, Iowa. I gave all this city directory research to my cousin and he did a little poking around but didn’t get very far when we visited the State Historical Society of Iowa in Des Moines. This John Newton person was suspicious. He was living at the same address? Elizabeth disappears. Well I sort of spilled the beans when I wrote in the post describing Henry and Elizabeth children: Do you remember the obituary for Ortha? Parke – Ortha Raymond Parke, passed away at his home in the Walsh Apartments at 6:40 o’clock this morning, after 18 weeks of illness. He was born in Davenport Feb. 16, 1900, and was educated in the Davenport schools, ad has been employed as an usher at the Fort Armstrong theater. Surviving are the parents, Mr. and Mrs. David E. Parke, one brother, Earl David Parke of Duluth, Minn. and one sister, Miss Viola R. at home. The maternal grandmother, Mrs. J.S. Newton of Fairfield, Fla. also survives. Funeral services will be held Monday afternoon at 2 o’clock from Runge’s chapel, and interment will be made in Oakdale cemetery. The Davenport Democrat and Leader, Sept. 5, 1924. I don’t know when my cousin obtained this information, maybe he gave it to me when we sat in his kitchen at his lovely home and I didn’t really catch it till much later. Several months later, after my trip to Iowa, I decided to just fool around on Ancestry.com and study the census. I could find no evidence of Elizabeth’s whereabouts in 1900, 1910 and 1920 until I found the Buford Family in West Palm Beach, Florida in 1930. Guess who was listed with her daughter? with her daughter Elizabeth Ann Spracklin Buford in Florida. 1930 US Federal Census, Florida: West Palm Beach, Palm Beach Co., Precinct #14, ED#50-18, SD#7, Sheet #13 A, pg. 849, Ancestry.com. Funeral services were held for Mrs. Elizabeth D. Newton, 92 and a resident of Bunnell for the past 30 years, on Monday at St. Christopher’s Church at Korona. Burial was at Espanola Cemetery, where her husband is also buried. Survivors include two daughters, Mrs. Margaret Parks of Bunnell, Mrs. Elizabeth Ann Buford of Sola, Cuba; three sons, John Daniel Spracklin of Blockwell, Okla., George Spracklin of Portsmouth, VA, Elroy Franklin Spracklin of Detroit, Mich., and a brother, Charles Downey of Portsmouth, Iowa. Sometimes you just take your time and study the clues and they will lead you to your goal. It might take a little while but don’t give up. I was so happy to find the 1930 U.S. Census information and share it with my cousin. Elizabeth is his great-grandmother. Elizabeth is no longer missing! We could use a tombstone picture but I am not planning to visit Florida soon, so we turn to Find A Grave and someone has posted the tombstone and information about Elizabeth. Find A Grave has a picture of Elizabeth’s tombstone and one of her 2nd husband John S. Newton is at Find A Grave along with an obituary notice given by the contributor. These documents have helped to identify the children who did survive for Henry and Elizabeth. I am a happy genealogist!